At this point, you should have the GNU tools configured, built, and installed on your system. 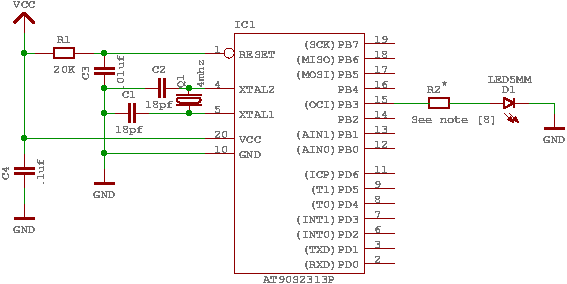 In this chapter, we present a simple example of using the GNU tools in an AVR project. After reading this chapter, you should have a better feel as to how the tools are used and how a Makefile can be configured. The main loop of the program does nothing – all the work is done by the interrupt routine! The sleep_mode() puts the processor on sleep until the next interrupt, to conserve power. Of course, that probably won't be noticable as we are still driving a LED, it is merely mentioned here to demonstrate the basic principle. This first thing that needs to be done is compile the source. When compiling, the compiler needs to know the processor type so the -mmcu option is specified. The -Os option will tell the compiler to optimize the code for efficient space usage (at the possible expense of code execution speed). The -g is used to embed debug info. The debug info is useful for disassemblies and doesn't end up in the .hex files, so I usually specify it. Finally, the -c tells the compiler to compile and stop – don't link. This demo is small enough that we could compile and link in one step. However, real-world projects will have several modules and will typically need to break up the building of the project into several compiles and one link. An even more useful option is -S. This option disassembles the binary file and intersperses the source code in the output! This method is much better, in my opinion, than using the -S with the compiler because this listing includes routines from the libraries and the vector table contents. Also, all the "fix-ups" have been satisfied. In other words, the listing generated by this option reflects the actual code that the processor will run.